estos CSTA Multiplexer for Panasonic is a CSTA Server that allows multiple CSTA Applications to access the Panasonic PBX system. 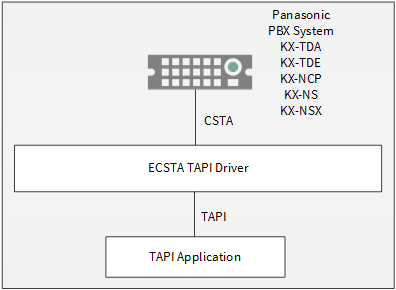 The CSTA Interface of the Panasonic PBX system may only be used by one CSTA Application at the same time. Using the estos CSTA Multiplexer for Panasonic, the interface is accessible by multiple applications at the same time. estos ECSTA for Panasonic offers a Telephony Service Provider (TSP) for Microsoft® Tapi 2.1 (also 2.2 and 3.0). This Tapi driver implements a central communication between a PC and the PBX system. estos ECSTA for Panasonic uses the CSTA protocol for connecting to the PBX system. For installation of the driver see Driver Installation. For administration of the driver see Driver Administration. The estos UCServer is a CTI/UCC server software which distributes the telephony information across the network using a graphical client or a multi-line TAPI driver. Workgroups, domains, Active Directory® and Terminal Server are supported. The estos CallControlGateway for Lync/OCS is a gateway that connects the TAPI-lines with the Lync/OCS server. This enables the Lync/OCS client to use traditional telephone devices via Remote Call Control (RCC). The Windows® Telephony Server is a component of Windows® server operating systems since Windows® NT. You will need a domain. The service is limited to domain users.